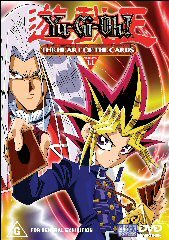 This disc contains three episodes of Yu-Gi-Oh, a Japanese anime series based on a comic book of the same name. The series has spawned a card game and even a breakfast cereal, which I find quite interesting considering that in actual fact the episodes contained on here are really rather dull. The formula is one most people will be familiar with: a young boy and his buddies travel about, righting wrongs and doing battle with various unsavoury types intent on some form of dominion or other. In this instance the battles involve the use of playing cards with a magical tendency to spring to life, however it seems to me to just be a variation of something that�s been seen plenty of times before, and frankly done quite a lot better. This is not to say the episodes are not enjoyable, in a turn-off-your-brain kind of way, it�s just that there are better examples of this particular type of entertainment available. However if you are a big fan of this kind of show then you�ll probably enjoy what this disc has to offer. The picture quality is very nice. It all looks nice and bright and cheerful, as would be expected from such a series. Some of the animation isn�t really amazing, but it definitely serves its purpose. The image is very sharp and there didn�t seem to be any aliasing problems. The 2.0 audio track is perfectly adequate, nothing to make viewers jump out of their chairs, but with nothing to complain about either. Everything sounds nice and crisp and there are no major issues to fuss over. Extras are fairly minimal but not completely nonexistent, basically all you get is a few character bios, stats sheets on some of the monsters, and a fairly abysmal �Yu-Gi-Oh Rap�. It won�t take anyone long to get through these. People who MUST have a fix of anime will probably glean some enjoyment out of this, but realistically there are far better discs to spend your money on. Not appalling, but certainly not great.